Mom life can be rough, even for the most organized and efficient moms out there. Why is that? I think a big reason is because we get so caught up taking care of our families, that we neglect to take care of ourselves. But how do you even do that? One huge way to take care of yourself is to find a creative outlet. For me, and many other moms out there, that outlet was to start a blog. Maybe you just need a place that is completely yours. A place to pour yourself into and make completely your own. Maybe you’re looking for a way to make money as a stay-at-home mom. If you’re like me, you’d love to combine the two and have the best of both worlds. Earlier this year I decided to start a blog, both in hopes of making a little money to supplement our single income, and to provide me a place to get creative. 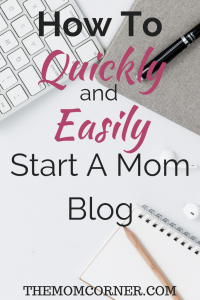 I’ll talk more in depth about the “why” in another post, but right now I want to talk about how to quickly and easily start a blog. This post contains affiliate links. I may earn a commission from any purchases made through my links, but I only recommend products and services I love and believe in. Probably the hardest part of starting a blog is coming up with a name for it. If you have even the slightest interest in monetizing your blog at some point, I highly recommend getting a domain name and self hosting (more on that in a minute–and you can get both through the same provider!). This is your first opportunity to think creatively. Maybe you want it to just be your name. Or maybe you want it to play into the niche in which you plan to write. If you’re not really sure what exactly you want to write about yet, or you think you might want to change it up later, consider picking a domain name that can be easily used for a different niche if need be. Once you have a good idea of what you want your blog name to be, it’s time to sign up for self hosting. This is the best way to set up a blog, and necessary if you want to monetize it. When I was researching hosting for my blog, I spent a lot of time comparing hosting companies before I chose to host with Siteground. And let me tell you, I have not been disappointed! It was the most inexpensive option for me and provides fantastic, professional service. 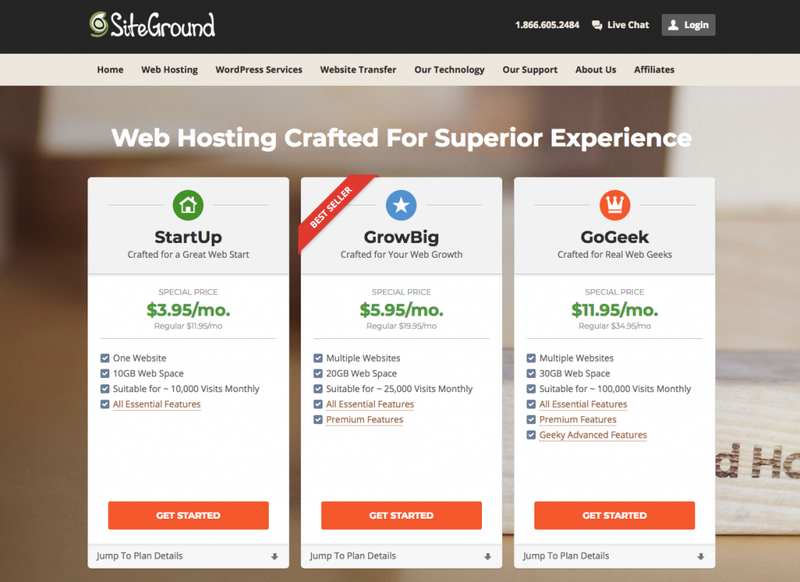 To get started, use my affiliate link to sign up for hosting with Siteground. My link will allow you to get a special, discounted price, regardless of what plan you choose or how long you sign up for! If you are just starting out, I would recommend signing up for the StartUp plan. Unless you already have a huge following, the StartUp plan will likely fill your needs as you get started out with your blog. You can always upgrade to a bigger plan if need be. Once you’ve picked your plan, it’s time to input your domain name. If you already have a domain name, you can plug it in now. If you haven’t registered one yet, now is a great time to register your domain name. Finally, you can review your order and make any necessary changes, as well as add on any extras you may want. After you’ve paid, your hosting is all set up and ready to go! 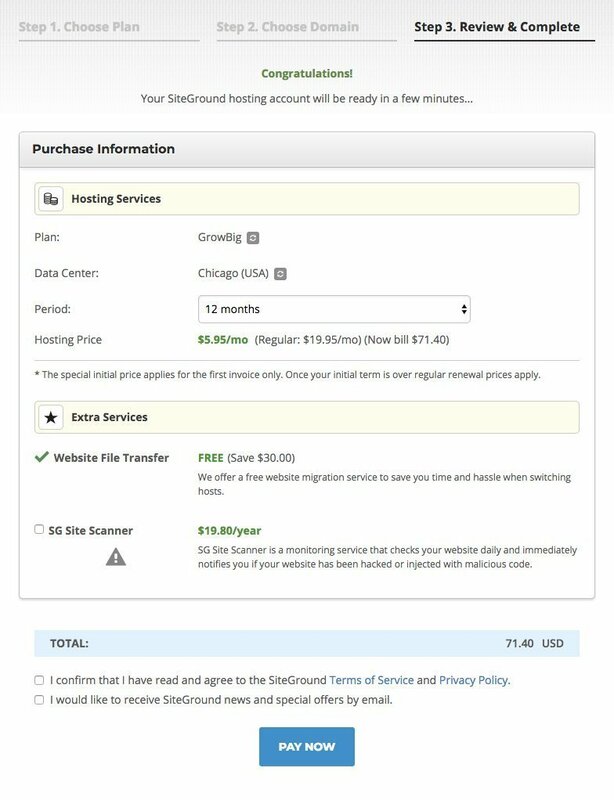 Once you’ve signed up for your hosting through Siteground, log into your account. From there, you’ll be able to quickly and easily install WordPress to set up your blog. Once it has installed, you’ll be able to log in and change your theme and start writing your awesome blog posts! After your blog is all set up, be sure to set up accounts for your blog on all the major social media sites. That way, you’ll be able to promote all the content you create and drive traffic to your blog. Honestly, yes. When I set up my blog, I spent more time thinking about what to call it than I did in anything else. It literally only took a few minutes to set up my hosting with Siteground and install WordPress. And it was so, so easy. If your interested in blogging, this is definitely the way to do it!